IBM scientist Flaviu Cipcigan has high ambitions. Despite recently being listed on Forbes magazine’s European 30 under 30 list for science and healthcare, he believes there is still much work to do to raise awareness and solve the challenges he is attempting to address with his research. 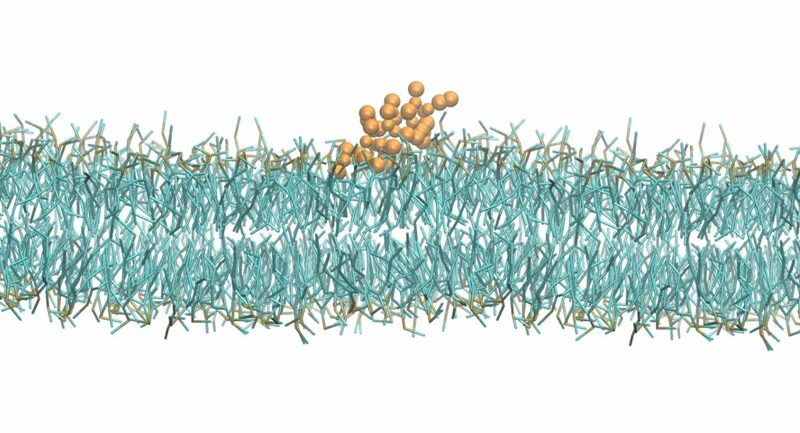 Simulation of the earliest contact of an antibacterial peptide with A the membrane of a bacteria. The peptide inserts, disrupts the membrane and then kills the bacteria. “Antibiotic resistance is a problem that doesn’t inspire as much urgency as other global challenges, such as climate change,” said Cipcigan, from his lab at the Hartree Center in England, where more than two dozen fellow IBM Researchers are collaborating in solving UK’s toughest problems. Cipcigan sees his role as the interface between data, physics and biology and his toolbox includes Big Data, computer simulation, AI and physics-based methods. Combined, these tools are a potent weapon for designing antibacterial peptides. He is working with collaborators from universities, government labs, and pharmaceutical companies, to test and ultimately manufacture the best chemical candidates. Incredibly, only a year into his research he has already designed one peptide that kills many types of bacteria. Cipcigan credits his teachers for his early success. During his PhD, Cipcigan had the opportunity to work closely with researchers from IBM’s Thomas J. Watson Lab and he spent two months there as a visiting scientist. Eventually he joined the growing IBM Research presence at the Hartree Centre. Five years from now, he sees a great influence from ethics in his science and quotes Freeman Dyson who said that, “the only cure for scientific progress is ethical progress”. Cipcigan believes that designing a new ethical framework for the 21st century is essential in guiding our use of scientific knowledge and our research going forwards. Before leaving for a meeting with clients, Cipcigan shares some advice for young people considering a scientific career. That just might be the recipe for the Forbes Under 30 list.